I’m looking at the HBO series “Big Little Lies”. I’ve watched the first ten minutes and I haven’t decided whether to watch anymore. The series is set in Monterey and its first season garnered lots of awards (4 Golden Globes and 8 Emmys). A casting call for its second season is front page news in the Monterey Herald. In my miniscule viewing, the show opens at night and two homicide detectives are seen walking up to an elementary school, where a fundraiser has gone tragically wrong. The all-star cast is headlined by Nicole Kidman, Reese Witherspoon and Shailene Woodley, who play three women that get embroiled in a murder investigation. Flashback and Witherspoon is seen driving her daughter to school, on the first day of school, for first-grade, across the Bixby Bridge. A jump-cut later she is involved in a near accident, just west of Lovers Point, three blocks from the school, which would put it in Pacific Grove. She trips, sprains her ankle and a voiceover says that maybe none of this would have happened, if she hadn’t fell. Maybe it’s a private school? That would go a long way in explaining her cross-jurisdictional commute, but at this point I was confused, so I did a little digging. Supposedly, the principals all live in Carmel Highlands, which is a community that is south of Monterey and south of its more famous near namesake, Carmel-by-the-Sea and all of these places are well north of the Bixby Bridge. Unless you are also filming a car commercial, then this commute makes no sense. As an aside, my brother Chris has sold a photograph of the bridge that was used in a review (HuffPo) of this show. Also, my Dad told me that in the ’50 he and Mom had looked at a lot in Carmel Highlands, before they eventually bought in Carmel Valley. Not that he would have seen any of his erstwhile neighbors homes featured in this show, because further research revealed that other than landmark Monterey area locations everything else was shot nearer to LA. 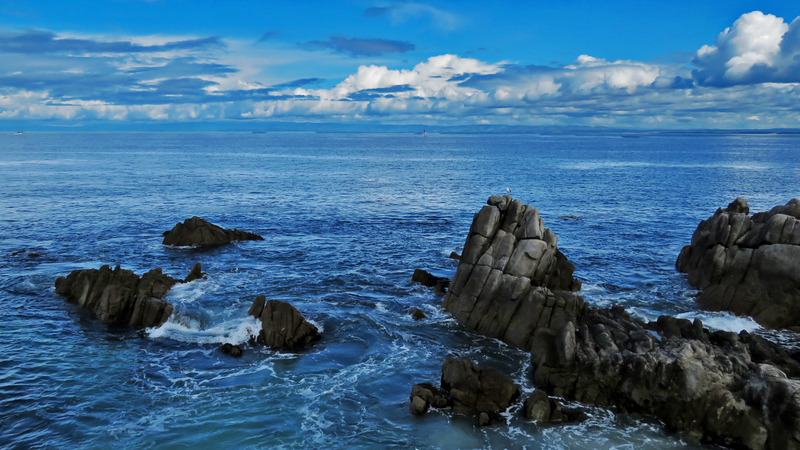 This entry was posted in Monterey, Photography, TV and tagged Big Little Lies by RegenAxe. Bookmark the permalink.